Domaine Durieu is a relatively new estate in the Southern Rhone Valley. It was created in 1976 when Lucile Avril, the mother of Paul Durieu gave him a few hectares of vines to get his career as a wine producer going. Shortly after that, Paul Durieu added an additional 5 hectares of vines, built a cellar and wine making facilities and Domaine Durieu was born. Since 1976, Paul Durieu has managed to continue to expand their vineyards to its current 37 hectare size. Today, Domaine Durieu owns 37 hectares of vines in Chateauneuf du Pape. The vineyard has old vines with the oldest vines being Grenache that was planted all the way in 1914. 36 hectares are devoted to the production of red wine and one hectare is used to grow grapes for white wine. Domaine Durieu makes 2 red Chateauneuf du Pape wines and 1 Chateauneuf du Pape Blanc wine. Domaine Durieu Chateauneuf du Pape – The wine is often produced from a blend of 80% Grenache, 12% Mourvedre and 8% Syrah. But that can vary from year to year, as some vintages also include small amounts of Cinsault and Counoise. The wine is aged for about 12 months in concrete vats before bottling. About 2,000 cases are produced each year. Domaine Durieu Cuvee Reserve Lucile Avril made its debut in 1999. The wine is named after the mother of the owner. The wine is usually made from a blend that is close to 90% old vine Grenache, 6% Mourvedre and 4% Syrah. 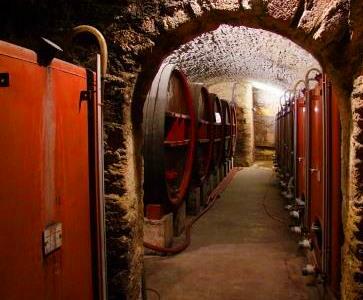 To produce the wine, the Grenache is aged in traditional concrete vats for 16-18 months. The Mourvedre and Syrah are aged for an equal amount of time in new, French oak barrels. The production averages 800 cases per vintage. Domaine Durieu Chateauneuf du Pape Blanc – The wine is produced from 80% Roussanne, with the remainder of the blend coming from Grenache Blanc and Clairette. Only 250 cases are produced each year. Domaine Durieu can be enjoyed on the young side. Young vintages can be popped and poured, or decanted for 1-2 hours allowing the wine to soften and open its perfume. Older vintages might need very little decanting, just enough to remove the sediment. Domaine Durieu is usually better with 3-5 years of bottle age. Of course that can vary slightly, depending on the vintage. In the best vintages the wine should be consumed within 4-18 years after the vintage. Domaine Durieu is best served at 15.5 degrees Celsius, 60 degrees Fahrenheit. The cool, almost cellar temperature gives the wine more freshness and lift. Domaine Durieu is best served with all types of classic meat dishes, veal, pork, beef, lamb, duck, game, roast chicken, roasted, braised, stewed dishes, sausage, barbecue and cassoulet. Domaine Durieu is also good with Asian dishes, hearty fish courses like tuna, mushrooms pasta, eggplant, tomatoes and cheese. The white wine of Domaine Durieu is best served with a myriad of different seafood dishes, shellfish, crab, lobster, sushi, sashimi, chicken, pork and veal, as well as Asian cuisine. Domaine Durieu also owns 68 hectares in the Cotes du Rhone and Cotes du Ventoux appellations where they produce both red and white wine. Lushly textured, silky, polished and fresh, there is plenty of licorice and sweet, dark cherry notes with a spicy edge to keep you interested. Still young, as you would expect, this medium bodied, kirsch filled, traditionally made charmer offers loads of sweet, spicy, black raspberries, earth and black pepper with lush textures. Although OK to drink today, give it another year or two and it should be even better. A super Chateauneuf du Pape at a great price is getting harder to find these days. But this wine wine delivers both value and great style. Dominated by old vine Grenache, the wine pops with fresh kirsch, jam, herbs and spice box aromatics. Open, opulent, fleshy and already delicious, this is a winner! Full bodied, plush, open and displaying ripe black cherries, kirsch liqueur, garrigue and spice in the nose, the wine is lush and carries it's ripe, old vine fruit intensity all the way through. Pepper, garrigue, jammy black raspberry and earth aromas were easy to find, But the wine felt flat on the palate.. This cherry dominated finish was short and to the point. This is an OK wine, but there is nothing that makes it special.